The TuffBank™ is a market leading brand of tool vaults, offering the best combination of superb quality and excellent value for money. This tough, sturdy range of site boxes and van boxes are built to a very high standard, boasting many anti-jemmy features which are unique to Armorgard. With 9 sizes to choose from, you can be sure a TuffBank™ will fit the job! 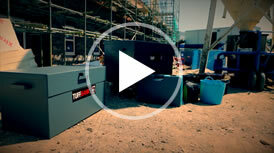 We have produced a NEW video, showing you why so many customers depend on the versatility of the Armorgard TuffBank range. It isn’t easy to explain in words, so we thought that we would show you the TuffBank ‘in action’ helping to explain why it performs so well, and why there are so many users demanding for the Armorgard TuffBank range. Check out the video and full details of the TuffBank range or contact us to help you in selling more of the TuffBank range.